Pure oats with a drizzle of honey. Tip into a bowl and add your favourite milk. Mix into a soft muesli or crunchy granola for a lighter start to the day. 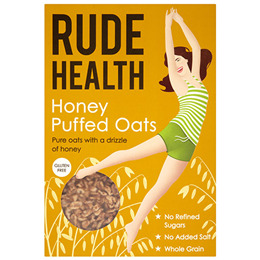 Pure oats really are pure. They`re kept separate from other grains to avoid contamination with gluten. Even if you`re not intolerant to gluten, it makes sense to give your body a holiday from the stuff. These oats retain all their taste and nutrition. They`re simply puffed up and drizzled with honey. Kick back and let the sweet, nutty oat flavour float over you. Wholegrain oats (83%), honey (17%). Below are reviews of Rude Health Honey Puffed Oats - 240g by bodykind customers. If you have tried this product we'd love to hear what you think so please leave a review.